As a result of operations on the high seas, on rivers, and in bays and harbors, the Navy was a decisive factor in the Civil War's outcome. The Union Navy blockaded some three thousand miles of Confederate coast from Virginia to Texas in a mammoth effort to cut off supplies, destroy the Southern economy, and discourage foreign intervention. The Navy joined with the Army to launch a series of major amphibious assaults, including those at Port Royal Sound, South Carolina, under Flag Officer Samuel F. DuPont, and Wilmington, North Carolina, led by Admiral David Dixon Porter. These successful actions sealed off Confederate blockade-runner havens, and assured blockading ships essential coaling stations and bases on the Southern coast. Admiral David Glasgow Farragut's victory at New Orleans denied Confederate egress from the Mississippi, and opened that mighty river to penetration northward by Union forces. In a giant pincers campaign, river gunboats moved north and south along the Mississippi and her tributaries. Following the capture of strategic Fort McHenry by Flag Officer Andrew Hull Foote, one Confederate river stronghold after another fell to the combined attack of the Union Navy and Army. Vicksburg, the final bastion, was battered into submission 4 July 1863, and the Confederacy was mortally split along the vital Mississippi artery. 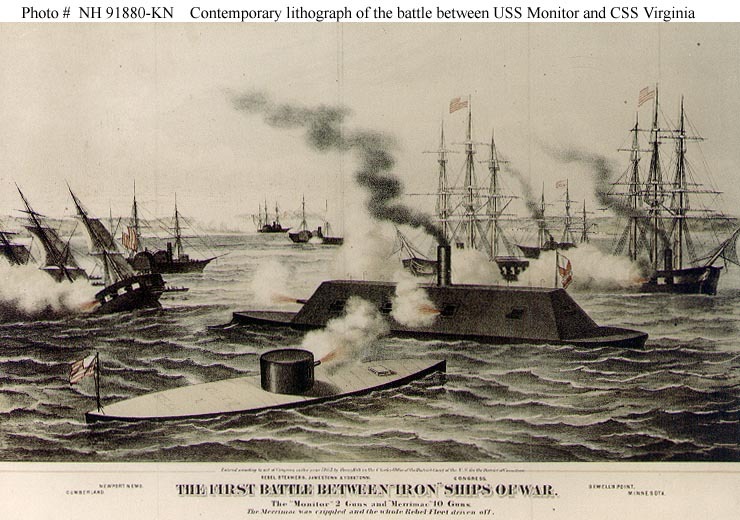 Meanwhile in the east, the historic USS Monitor-CSS Virginia (ex-Merrimack) battle, first combat between ironclads, marked the dawn of a new era in naval warfare. The most famous of Confederate commerce raiders, CSS Alabama, Captain Raphael Semmes, played havoc with Northern shipping until being brought to bay off the French coast and sunk in a ship-to-ship duel with USS Kearsarge, Captain John Winslow. Although Confederate forces fought valiantly throughout the war, control of the sea by the Union Navy isolated the South, and gave Northern military forces the added dimension of mobility which sea power provides.